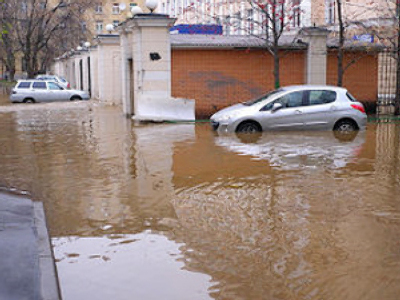 A burst water main in Moscow has flooded three streets and caused lengthy traffic jams in the north-east of the city. Dozens of apartment buildings have been waterlogged and scores of cars parked along the streets and in backyards have been submerged. The Metro became packed as people looked for an alternative way to get to work during the rush-hour. An almost one meter-diameter cast iron pipe on Malomoskovskaya street, burst at around 6am on Tuesday. It was one of the main pipes in the city’s water supply system. Cold water streamed out, turning three nearby streets into rivers, within minutes. As the accident occurred early in the morning, before the usual traffic jams, it took just minutes for maintenance and emergency vehicles to be at the scene. Although witnesses said the water continued pouring out until after 9am. Numerous fire brigades arrived to pump out the water from the basements of nearby buildings. Traffic police cordoned off the area and closed the roads. An emergency control unit was at the scene to coordinate the operation. Electricity was cut off in dozens of apartment buildings in the area following the accident. The city’s mayoral press service has reported that locals have been provided with electricity through mobile power stations. It says water supply has not been affected. While specialists are working at the scene to find out exactly what happened, the authorities say a shift in the ground could be among the possible causes. The mayoral press service also said the city’s ageing water supply system could also be to blame. The Prosecutor’s Office has started an investigation to establish the cause of the disaster and the resulting losses. Russian bloggers were quick to react to the leak, with some tweeting with sarcasm, “TV is frightening us with traffic jams in the north east… Well it’s time for me to swim out from home, too!” Others have used just a few words to describe the situation as a whole: “Prospect Mira is hell now!”. The burst water main was the first serious test for the newly-appointed head of the capital. Sergey Sobyanin, former Russian vice-premier, became Moscow mayor after his predecessor, Yury Luzhkov, was sacked last month by President Dmitry Medvedev because of “loss of confidence”. Shortly after he took office, Sergey Sobyanin outlined the major challenges the Russian capital is facing. Traffic and corruption have been put at the top of his to-do list.